OuUnPo is a European research network made up of artists, curators and researchers. Together they travel to different cities and investigate a given problem in dialogue with local creators, nmuseums, art organisations, research centres, residency programs, and informal groups. 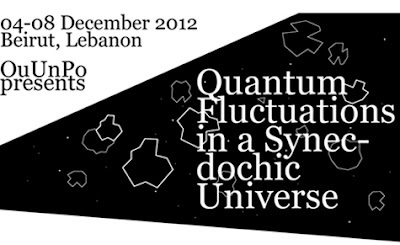 With the enactment of Quantum Fluctuations in a Synechdochic Universe in Beirut, OuUnPo launches a 2-year itinerant research project on “Catastrophe & Heritage”. OuUnPonians and local participants will investigate how a catastrophe and a situation of crises embrace potentiality for creation, how architectural and cultural heritage contains the seeds for future developments. The diverse and multiple interactions of these notions will be witnessed, experienced, supposed, analyzed, contemplated, performed, discussed, contested, negated, emphasized in Tokyo (Spring 2013), Sweden (Fall 2013) and Sao Paulo (Spring 2014). “In a mapped configuration of time-space, OuUnPo lands at a temporary shift in the magnitudes of entropy and gravity. It is one in a multitude and finds itself when the unknown starts. It is a twofold encounter, one contemporary with its participants, the other with an inhabitant of age, which you would call a distant future. What happens is only possible to seize in its aftermath. Recurrence of places is a possibility yet there will be no repetition. Guided by the uncertainty principle the encounters will unfold as moderate conditions are at hand. Curated and organised by Sara Giannini & Fatos Üstek. More info and program here.